Did you know that girls give negative feedback differently from boys, that Ibn Al Hytham got the idea of a pinhole camera when he was under house arrest or that the ancients used notches on bones to mark numbers? These and more questions were answered by Al Qamar students who presented their research projects on the Annual Open Day held on March 31st 2018. 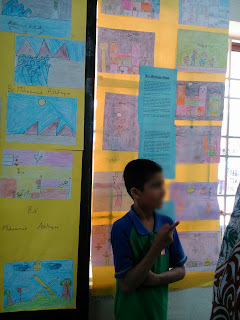 Open Day is the annual showcasing of student projects – projects independently chosen, independently researched and independently written by children from Grade 2 upwards. The choice of projects reflects each child’s personal interest and passion. This year, Open Day was attended by over 150 people. Grade 2, the babies, really impressed with their vast array of projects. 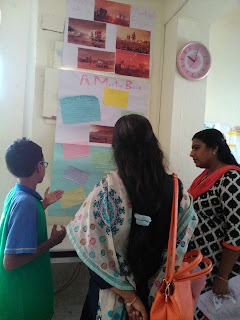 While Ameen took us through a history of cars and related an interesting anecdote about Bertha Benz, Athiya, narrated the many stories she has penned about castles, princesses and adventure. Samara’s Pinhole camera and her detailed explanation was a runaway success while Hamza’s lucid explanation on hurricanes and tornedos were impressive. Riina, Grade 3, did her whole project on demonstrating the different kinds of shading used in art and taught the skills to her visitors. Hamdan had an exciting presentation on the history of cameras – using information he had garnered at the Museum of Photography – including a 200kg World War camera. Zoya & Hajira were commended by visiting doctors on the clarity and detail of their explanation of the human digestive system. And Ashfaque’s horror stories about “Bloody Mary” with bone chilling illustrations sent shivers up our spine, followed by amused grins. And finally, to provoke our conscience came Muiz’s research on pollution with a focus on the Great Pacific Garbage Patch. Grade 4 had a bunch of interesting research projects. 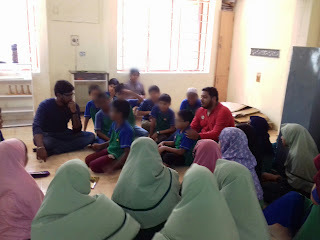 Asad was a veritable encyclopaedia on Rockets and Space travel, and Dakshin wowed us with the History of Mathematics which showed how different civilizations created and used numbers. 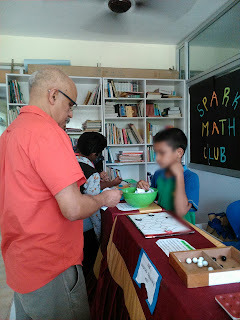 The Science Corner with experiments on Water and Air was dominated by the 4th graders who engaged the visitors with their scientific explanations. 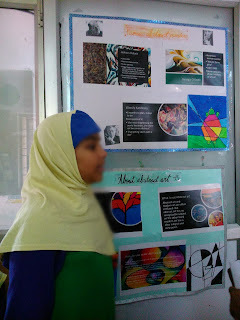 Hafsa’s project was unique – on codes and cyptography, Al Kindi and the Enigma machine. She even created sample codes for visitors to crack. Sarah’s project, executed while she was sick with viral fever, was an incredible explanation of static electricity – a concept unknown to me till middle school! Fifth grade projects were even more detailed and advanced. Fareeha conducted a research at school on whether girls give negative feedback differently from boys. “Girls tend to hide their true feelings while boys just blabber out what they think” she explained. Abdullah talked about the World Café held at school to identify ways in which children would like to be made environmentally conscious. “We kids can write books for other kids, we can create “Walls of Mercy”, we can donate our textbooks to the lower grades” were some of his ideas. Ishal had a lovely project explaining Abstract Art, “which isn’t the same as modern art, because Abstract Art has emotion and feelings, not form”. Hasna talked about her rights as a Muslim girl – how she has rights to her own money, marriage decisions and education, while Mariam showcased inspirational modern Muslim women. Anam, our resident bookworm, had a project on books with curious anecdotes – did you know books were so precious once that they had to be chained to the library shelves? And Majid – our future astronaut – discussed a projected human colony on Mars. Hiina had a lovely project on the mosques in Chennai complete with a map marked with locations. Rayya’s project on Islamic Geometric Art with challenge cards for readers to use basic geometric skills to draw tessellations, geometry stars and 5 point roses was fascinating. 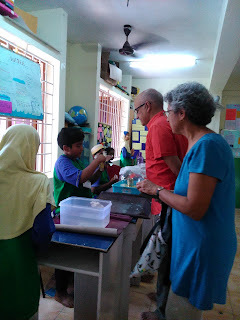 Amongst the 7th graders, Aathif showcased his tech models made using junk – plastic bottles, ice cream sticks etc. He also demonstrated how variables are important in scientific investigations by using pendulums. Iman’s had us drooling with her project on the history and global connections of biryani while Asma & Fathima showcased the Arabic books they have written for children. "JAM or Tongue Twister for you, Sir?" Children had also organised activities for visitors. One hot favourite was the Potpourri Room – with fragrances, pleasing decorations and nasty challenges – JAM, Word Charades, Idiom Hunters and Tongue Twisters. The visitors had a wonderful time trying each challenge out amidst great laughter. The Spark Math Club corner with its strateg games and math puzzles – from Pentago, 7 cubes, pentominoes and others had visitors scratching their heads and trying out different puzzles to win chocolates. “Fabulous”, “Fantastic” was the feedback from the visitors. Many commented on how articulate and confident the children were in facing the public, answering questions and giving explanations. Guests were impressed with the fact that the projects were clearly independently done and genuine – a refreshing departure from the current practice of parent executed or bought out projects. Kudos Al Qamarians. You shone again!